Puerto Galera, on the island of Mindoro, consists of several towns and beach resorts that have melded together on a protruding piece of land shaped like a whale's tale to form the Philippines' fifth-largest urban area. The Spanish traders used the natural harbour created from the land formation as a refuge in the 16th Century, hence the name, which means 'Port of Galleons'. 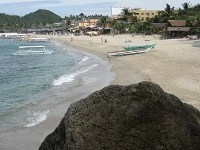 Puerto Galera was declared a protected area by a UNESCO programme in the 1970s. This put the area on the tourist map and helped with the resurgence of interest in its marine life and coral reefs, which had been suffering because of dynamite fishing. Puerto Galera is now one of the most sought-after scuba diving locations in the world, and the island of Mindoro also offers some richly rewarding hiking trails. There are more than 30 dive sites within 10 minutes of the three main beaches; deep trenches and vibrantly colourful reefs characterise the waters, along with numerous wrecks, a shark cave and a shelf with a 164 foot (50m) drop-off. Among the famous beaches in Puerto Galera are Sabang Beach and White Beach, which both have an active nightlife with numerous bars and restaurants lining the beachfront. There are also many tiny beaches and coves to enjoy for those wanting something a little less crowded.